Nationality: American. Born: Kathleen Doyle Bates in Memphis, Tennessee, 28 June 1948. Family: Married the actor Tom Campisi. Education: B.F.A., Southern Methodist University. Career: Worked in regional theater in Washington, D.C., and at the Actors Theater in Louisville, late 1960s; moved to New York to pursue acting career, 1970; worked as a singing waitress in a Catskill Mountain resort, early 1970s; made screen debut in a bit role in Taking Off , 1971; had first off-Broadway role in Vanities , 1976; began appearing in roles on TV series, and had recurring role on daytime soap All My Children , 1977; made Broadway debut in Goodbye Fidel , 1980; had first important screen role in Misery, 1990; directed episodes of the TV series NYPD Blue and Homicide: Life on the Street , 1993 ; made feature directorial debut with the TV movie Dash and Lilly, 1999. Awards: Best Actress Academy Award, Best Performance by an Actress in a Motion Picture—Drama Golden Globe, and Chicago Film Critics Award, for Misery , 1990; Best Performance by an Actress in a Supporting Role in a Series, Mini-Series or Motion Picture Made for TV Golden Globe, for 3rd Rock from the Sun, 1996; Outstanding Performance by a Female Actor in a TV Movie or Mini-Series Screen Actors Guild Award, for The Late Shift, 1996; Best Supporting Actress Chicago Film Critics Association, Outstanding Performance by a Female Actor in a Supporting Role Screen Actors Guild Award, for Primary Colors, 1998. Agent: Ssan Smith and Associates, 121 North Vicente Boulevard., Beverly Hills, CA 90211, U.S.A.
Interview with Sonia Taitz, in New York Times , 21 August 1988. "I Was Never an Ingenue," interview with David Sacks, in New York Times , 22 January 1991. Interview with Nikki Finke, in New York Newsday (Melville, New York), 28 March 1991. Interview with Michael Lassell and Timothy Greenfield-Sanders, in Interview (New York), August 1991. Interview with Jean-Luc Vandiste, in Écran Fantastique (Paris), June 1996. Farrell, Mary, and Craig Thomashoff, "Wallowing in Misery , Kathy Bates Bludgeons Her Way to Stardom," in People Weekly (New York), 24 December 1990. Ferguson, K., "Kathy Bates: The Unlikely Star," in Film Monthly (Berkhamsted, England), June 1992. Gelman-Waxner, Libby, "She Ain't Heavy," in Premiere (New York), July 1995. Farber, S., "Kathy Bates in 'Dolores Claiborne," in Movieline (Los Angeles), June 1996. Kathy Bates is a fine actress with a natural, straightforward style, who for years had impressed discerning viewers and critics with her stage work. But despite this recognition, she failed to break through the boundaries of regional and New York-based theater into the mainstream of the motion picture industry. Indeed, between 1979 and 1987 she originated roles in three hit stage plays: Crimes of the Heart , 'night, Mother , and Frankie and Johnny in the Clair de Lune —the latter a part written especially for her. Yet when it came time to cast each property for the big screen, Bates was replaced by, respectively, Diane Keaton, Sissy Spacek, and Michelle Pfeiffer. The reasons were twofold: Not only was Bates an unknown celluloid commodity, but at 5' 4" with a square build she lacked the inborn glamour of standard Hollywood leading ladies. In the late 1980s, Bates offered an explanation for Hollywood's hesitation to cast her when she declared, "I do lose roles because I'm not slender and glamorous." When not appearing on stage, Bates earned a living in guest spots on prime-time television series and made-for-television films. She even had a regular role in the popular daytime soap opera All My Children . Feature film roles were infrequent and, for the most part, forgettable. Bates was past her 40th birthday when Rob Reiner became the first Hollywood director to recognize her screen power. 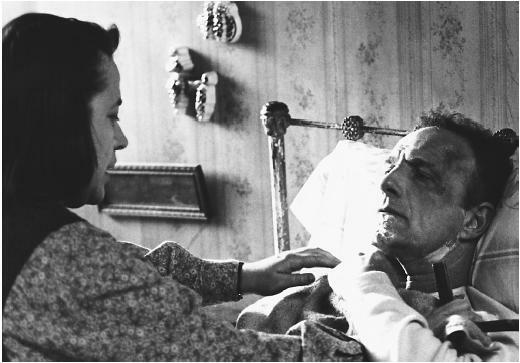 He cast her in what was to be an Academy Award-winning performance in Stephen King's Misery , playing Annie Wilkes, the "Number One Fan" of a famous romance novelist (James Caan), whom she nurses after he is injured in a car accident. Annie is significantly psychotic, and the bedridden writer soon becomes her prisoner. Bates's bravura performance is nothing short of extraordinary. She unveils an astonishingly wide range of emotions as she befriends and then suddenly taunts her captive. This breakthrough performance was proof that Bates could be a dynamo in character roles. Misery , however, was not her first interesting screen role. In the little-seen The Road to Mecca , based on a play by Athol Fugard, she was cast as a Capetown, South Africa, teacher—a part she earlier had played on the stage, but which was not considered significant enough for her to have lost it to a more well-known performer. The year following the release of Misery , Bates created the pivotal role of Evelyn in Fried Green Tomatoes , the screen version of Fannie Flagg's offbeat novel. Bates plays a repressed Southern housewife who meets an elderly but spirited woman (Jessica Tandy) who resides in a nursing home. The old woman's intricate yarns of people and events of the 1920s have a decided influence on Evelyn's own lifestyle. Bates's power-packed portrayal of Evelyn works in tandem with Tandy's more delicate but equally forthright performance. The vigor of the pair (who appeared together one more time in Used People ) represents a collaboration of the best of two generations of actresses. Two other pivotal Bates performances came in A Home of Our Own , in which she is cast as a spirited single mother who settles with her children in a small Idaho town; and especially Dolores Claiborne , also based on a Stephen King story and her best role since Misery . In Dolores Claiborne , she offers an award-caliber tour de force as the title character, a Down East Maine woman accused of killing her boss—and who years earlier may have done in her abusive husband—and who is reunited with her long-estranged daughter (Jennifer Jason Leigh). Here, Bates and Leigh, cast as characters who share a deeply complex and involved personal history, play opposite each other just as impressively as Bates and Tandy had in Fried Green Tomatoes . In the second half of the 1990s, Bates most often found herself playing dominating, larger-than-life characters. Some merely were colorful (Molly Brown in Titanic ), while others were pushy and manipulative (Helen Kushnick in The Late Shift ). In 1998, Bates had two of her most outstanding character parts in a pair of decidedly different films, one a loosely based-on-fact satire grounded in reality and the other a no-brainer farce. The first is Primary Colors , a sharply-written adaptation (by Elaine May) of the best-selling fictionalized chronicle of the first Bill Clinton Presidential campaign. Here, the full-bodied Bates plays a foul-mouthed, bossy campaign operative, a "dustbuster" whose task is to protect the candidate from accusations of scandal. She is Libby Holden, a "true believer," a woman dedicated to getting good candidates elected. Libby cut her teeth on the McGovern campaign, and then spent the next two decades having mental breakdowns and living in and out of mental hospitals. This role offers Bates a full range of stances and emotions, from tough and ruthless to weakened and despairing. In The Waterboy , Bates is hilarious as Mama Boucher, a buxom bayou widow who controls every aspect of her son's life. Her apron-strings strangle the young man's aspirations as she prevents him from playing football and obtaining an education and a girlfriend. In this film, Bates has the singular challenge of fitting into the same celluloid fantasy world as the star, offbeat comic actor Adam Sandler. She deftly develops her character, as she speaks her bayou lingo and gestures broadly and comically. Without ever competing with Sandler's comic style, Bates builds the character of a weirdly memorable matron who complements and even fills out Sandler's universe. Then in 1999, Bates made her directorial debut with a made-for-television feature film, Dash and Lilly, about the love affair between the writers Dashiell Hammett and Lillian Hellman. Although the film lacked pacing and a solid viewpoint, it does not seem unlikely that a woman with such a strong command of acting will be able to develop a more controlled skill for directing. Character actresses traditionally have benefited from age in the film industry. In middle age, Kathy Bates finally and deservedly has been able to attain—and maintain—stardom as a reliable and occasionally riveting motion picture character performer. Her success is proof that there is room in Hollywood for both the slender "glamour girl" and the commanding character actress.